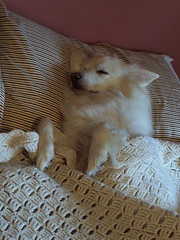 Itchmo: News For Dogs & Cats » Blog Archive » 5 More Minutes Mom! Didn’t get any sleep last night because the dog hogged the bed? This entry was posted on Sunday, May 20th, 2007 at 3:50 am	and is filed under Dogs, National Dog, Cat & Pet Info, Art & Pictures of Cats & Dogs. You can follow any responses to this entry through the RSS 2.0 feed. Both comments and pings are currently closed. This is a perfect example of how people treat their ” property “. This picture should be tattoed on the right hand of all pet food providers. It would remind them of what these babies mean to their family. And what it means to see them suffer.